The PRS SE Tonare T40E Electro Acoustic Guitar in a Natural finish combines premium tonewoods with PRS' reputable build quality and Fishman electronics to create a winning combination. Every guitarist from beginner to seasoned professional will love the way the T40E performs. 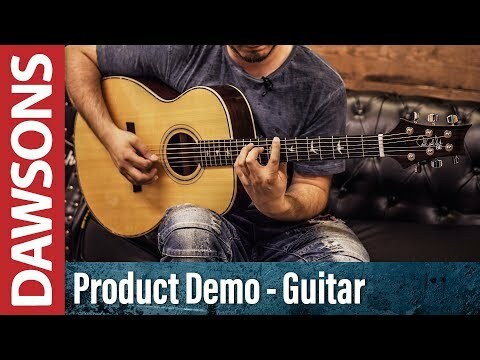 It is the ideal guitar for anything from jamming along to your favourite tracks at home, or performing to adoring crowds on the festival stage. The elegantly shaped body profile plays like a dream, allowing you to perform seated or standing in equal comfort. The shallow body depth pairs with the diminutive lower bout to create a snug feel, whilst the single-cutaway affords easy access to highest frets. For its size, the Tonare boasts an impressive energy, delivering a confident output that makes it ideal for solo performances, or as an ensemble instrument. The Tonare T40E is built using ovangkol for the back and sides, a tonewood that has been adopted by many luthiers due to its full midrange and subtle high end. Thanks to its careful tonal handling, ovangkol is the ideal choice for fingerstyle players. The top is built using solid Sitka spruce, which creates a superb soundboard thanks to its outstanding resonance. Supported by PRS hybrid "X"/Classical bracing pattern, the top has received ample reinforcement to ensure its longevity for years to come. The PRS SE Tonare T40E is equipped with the Fishman GT1 electronics' system, which is designed to translate the rich acoustic timbre of the guitar with absolute transparency. Featuring an undersaddle pickup, and soundhole-mounted preamp, the volume and tone controls are within easy reach for ready adjustment. Whatever environment you're performing in, you can shape your guitar's output to suit. Each PRS SE Tonare T40E Electro Acoustic Guitar is supplied with a PRS hardshell case, so that you can take your new pride and joy with you to wherever your music takes you.